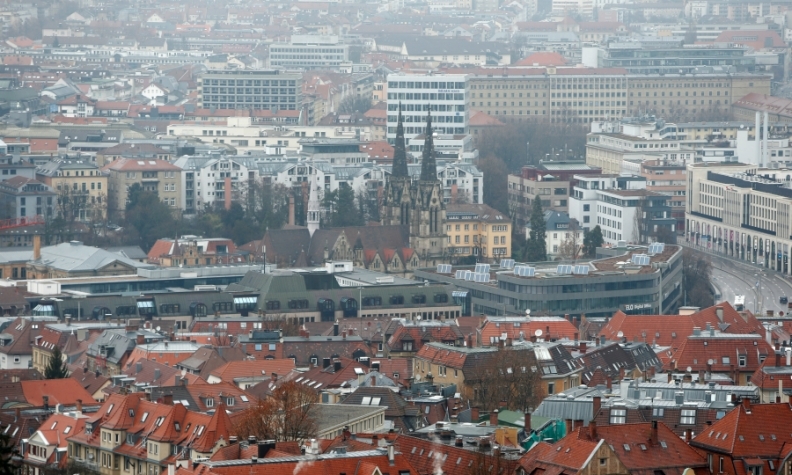 Stuttgart is particularly affected by emissions pollution because it is in a valley. BERLIN -- Stuttgart, home to Germany's Mercedes-Benz and Porsche, will ban from next year diesel cars which do not meet the latest emissions standards from entering the city on days when pollution is heavy. Only around 10 percent of diesel cars in use on German roads at the start of 2016 conformed to the Euro 6 standard, which is the latest EU anti-pollution rule. Engines which adhere to the standard produce fewer nitrogen oxide fine particle emissions, which cause respiratory disease. Diesel is particularly in focus following the Volkswagen Group’s emissions-cheating scandal, which was revealed in September 2015. Particulates often exceed thresholds set by the European Union in at least 90 German towns, including Stuttgart, which is particularly affected because it is in a valley. Germany has already been sued by the EU for exceeding those thresholds for more than a maximum of 35 days per year. Exceptions to the ban in Stuttgart, which is the capital of the state of Baden-Wuerttemberg and governed by a coalition of the environmental Greens and Chancellor Angela Merkel's conservatives, could be granted for goods vehicles. The regional government has also been sued by the German environmental organization Deutsche Umwelthilfe (DUH) for failing to do enough to tackle pollution. As well as diesel exhaust emissions, oil-fired heaters, chimneys and tire abrasion also contribute to the particulates problem, which is exacerbated by certain weather. The World Health Organization (WHO) said last year that outdoor air pollution in both cities and rural areas was estimated to cause 3 million premature deaths worldwide per year in 2012, due to exposure to small particulate matter which cause cardiovascular and respiratory disease and cancers.